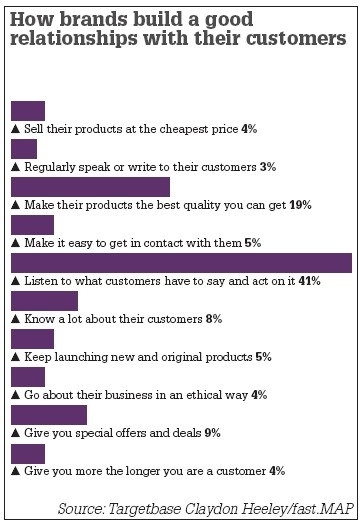 What’s interesting here is that customers clearly want brands to listen and respond to them, and favour those that do with their business- and perhaps more importantly, with their loyalty. Brands that engage in a dialogue with their customers- via for example social media channels- are more likely to successfully generate positive word of mouth than those perceived as simply “selling” products and services through promotions, deals and discounts. It’s telling that the six “key values” the research identifies as important to consumers include respect and understanding. When we enter a conversation, we want to be respected; when we speak, we expect that we will be heard and understood. Brands seeking to speak to their customers through social media marketing should bear this in mind when developing their online strategies, and take steps to ensure that their Tweets and status updates convey willingness to engage in interesting, meaningful dialogue. In the current economic climate, the temptation to scale back brand development and customer relationship building and focus on aggressively promoting products and special offers may be strong. However, as this article suggests- and as the customers surveyed would likely agree- developing strong, long-lasting and mutually beneficial relationships with clients is undoubtedly a more fruitful strategy.